Please find attached a flyer developed by the Department of Primary Industries, Recreational Fisheries Management Team following complaints about spearfishing at Shark Beach, Nielsen Park. "We are proposing to provide copies of the flier to National Parks rangers to distribute to spearfishers and members of the public. The aim of the flier is to remind spearfishers about appropriate behaviour etc but also inform the public that spearfishing is a safe and legitimate sport which is allowed at this location. This will hopefully help reduce conflict as it seems some members of the public are unaware that spearfishing is a legal activity at this location." Copies of the flyer will also be distributed to Sydney Compliance Officers as well as to the USFA. This is a great initiative by DPI on behalf of Spearfishers. The USFA are very grateful for their efforts and have welcomed the opportunity to be part of this process to further advocate for the rights of NSW Spearfishers. Please distribute to your members and other interested parties. After conquering a few mental fears equalisation is normally the biggest obstacle that most spearfishers will encounter. The reason we need to equalise is because it bloody hurts you if you don’t. How’s that for a good enough reason? Seriously, hydrostatic pressure (10m ocean depth is equivalent to 1 mile high in the sky. We take approximately 10 seconds to arrive at 10m). That’s why we need to equalise. As you descend the water pressure increases hence the pressure increases inside your ear canal, hurting your tympanic membrane (ear drum) – you have to “equalise” this outside pressure by matching it with air pressure that you have inside you. Equalising maintains pressure balance between the middle ear space, the rest of the body and surrounding water. The Eustachian tube comes into play here, this tube runs from the back of your nose to the air space of the middle ear. The tube is generally collapsed, opening when the “clearing” (equalising) process eventuates. When you experience the “crackle, pop” sounds you are equalising, relieving the pressure on the Tympanic membrane and sinus cavities. Correct technique and equalising before you experience discomfort is the key to comfortable spearfishing, and ensuring there is no chronic damage to your eardrums. The current Dive Safe campaign by Roads and Maritime Services NSW “LOOK OUT Divers About” is to be applauded. The confusion surrounding the role of the alpha flag in Australia is slowly unravelling and now a distinct message is being sent to all skippers in NSW on what to look out for – Divers – on the surface – can be up to 100m from their float/flag. Steer clear. Launching a boat and the general area around a boat ramp can be a very hazardous place. You have risks of slips and falls, being run over by cars and boats, getting squashed or crushed, being struck or just plain old manual handling lifting your gear and catch in and out of the boat. Caution and safe practice is not only important launching or retrieving a boat, considerable care and safe practice must also be used whilst travelling in the boat and at sea in general. The following Boat Safety Guide was put together by the Central Coast Sea Lions Club and details a lot of the risks and controls to be considered and managed whilst working with boats. Please take the time to look through this quality document and then go to our Training page to sit the quiz. There are many things to consider when discussing Diver Safety. Not only are there the technical aspects of being a safe diver, but there is also the whole concept of understanding and developing a correct safe attitude and culture. The articles and content within this Diver Safety Section aim to inform as well as encourage all forms of best practice when it comes to the safety of yourself and your dive buddies. Please ensure that SAFETY ALWAYS COMES FIRST. No fish or deep dive is worth your life. Don't put your life on the line. Watch this 'Spearfishing Safely' Video which explains the basic essential knowledge. A guide to safe underwater fishing, from the Recreational Fishing Alliance of NSW and Underwater Skindivers and Fisherman's Association. It wasn't easy waking up to hear reports that a spearfisher had been struck by a boat back home. It was early one morning, while I was holidaying at Surfers Paradise QLD, when I heard on the radio that a spearfisher had been struck by a boat off the coast of Currarong on the NSW South Coast. I immediately woke to grab my phone and started the frantic calls to check if it was one of my dive buddies. Three out of Four answered their phone. One phone went through to message bank. I hopped online, switched on the TV and started looking for information. An hour had passed and I still didn't have a return call. I had a gut feeling that he was gone. FaceBook started to wake up and many posts started appearing in the online spearfishing fraternity trying desperately to find information. It was about half an hour later that I read on a mates wall “R.I.P” posted by a friend. It was now obvious to me, that the worse had happened to one of my good dive mates. The day passed with many thoughts, mainly all the times that we went diving together and all the early morning calls that I would get, nagging me to go diving. Its only now that I am thankful that I did drag myself out of bed and go have a dive. Months passed before I got back into the water. It was only then that I realised the dangers of diving. I had numerous close calls before with boats, but never really thought anything of it. We were a drop in the ocean, I thought. We would have to be in the wrong place, at the wrong time, in the wrong 30cm x 30cm section of water, I thought. It would never happen to me or a mate, I thought. Oh how wrong I was. Even though he was using a float and flag, was experienced and knew the area well, he still died. At the time of writing, just over a year has passed. A day does not go by without the thought of a good mate passing away. I hope that this short life experience of mine at least gets one of you to use a float and flag, dive with a buddy and keep a damm good lookout. I wish no one to go through the pain that I did. I wish that everyone in the ocean could work in harmony. 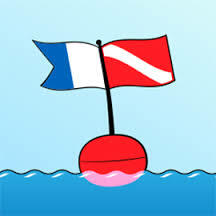 Please keep the rules of diving at the forefront of every breath and dive safe. 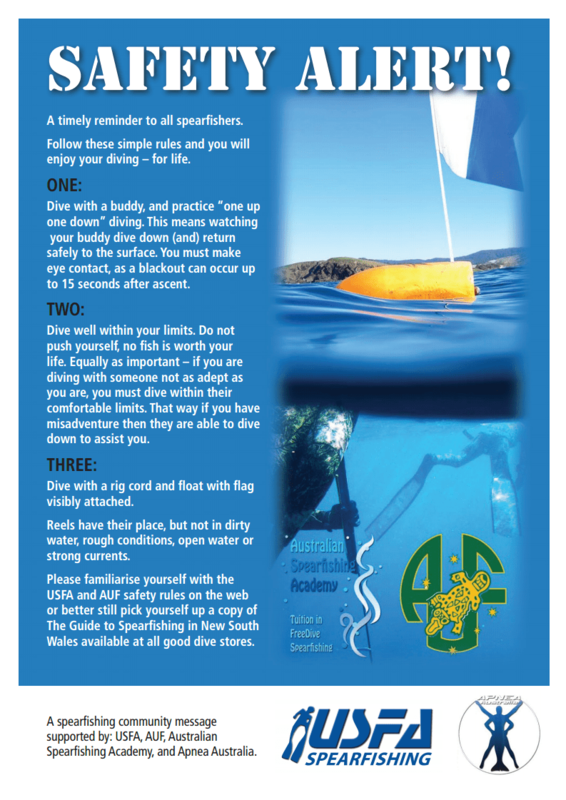 Please familiarise yourself with the USFA and AUF safety rules on the web or better still pick yourself up a copy of 'The Guide to Spearfishing in New South Wales' available at all good dive stores. Shallow water blackout is a loss of consciousness caused by cerebral hypoxia towards the end of a breath-hold dive in water typically shallower than five metres (16 feet), when the swimmer does not necessarily experience an urgent need to breathe and has no other obvious medical condition that might have caused it. It can be caused by taking several very deep breaths, or hyperventilating, just before a dive. Victims are often established practitioners of breath-hold diving, are fit, strong swimmers, and have not experienced problems before. Watch this video on Sambas and Blackouts by Erez Beatus an AIDA Freediving Instructor and Judge, Former Freediving Coach for Israel and Former Freediving World Record Holder. Thankyou and credit to the North Shore Underwater Club and Erez for this essential and valuable safety video.